A mission to Mars has captured the public’s imagination and the possibility of making that second small step has never seemed so close. Current NASA plans include sending humans to the red planet as early as the 2030s. Should we ever establish colonies on Mars, we’d need to build power generation engines. This would imply finding energy sources and working substances to convert heat into useful energy. Now, in research published in the journal Nature Communications, my colleagues and I have found a way to make this happen using a substance easily found on the planet: the solid form of carbon dioxide, known as dry ice. We have developed an engine which can harvest energy from dry ice as it turns from solid into gas. For Martian exploration, it could be a game changer. Long Island dry ice tea? To understand why, let’s go back to Earth for a moment. Here, we use water to turn the energy stored in coal, oil or gas into useful mechanical or electrical energy through what is known as a “heat engine”. In a steam engine, the most common form of heat engine, fuel is used to heat up water which then vapourises into high-pressure steam. This steam then powers a turbine to generate electricity, or a locomotive engine to create motion. Water is an ideal substance to use as it is widely available and cheap, and it is capable of undergoing a phase change (from liquid to vapour) within temperature ranges that are easily achievable with our current technology on Earth. This whole situation changes dramatically on Mars; although water is still available on the surface of the red planet, it is locked in solid form. Heating it to melting point and then to boiling point to use it as a working substance requires a lot of energy. However Martian dry ice already exists close to its “sublimation point” – the temperature at which it turns directly from solid to gas. It therefore only takes a relatively small nudge for dry ice to change states. The challenge is to harness the energy released by this change to power a heat engine – or even a whole colony. We turned to a common scientific effect you’ve probably noticed before in your kitchen. When a water droplet is placed on a hot surface held above 100ºC it boils off, creating steam. However when the surface is heated above a certain temperature, known as the Leidenfrost point, the water no longer boils away. Instead, the drop sits on a layer of its own vapour and levitates on top of the surface. This is known as the Leidenfrost effect. 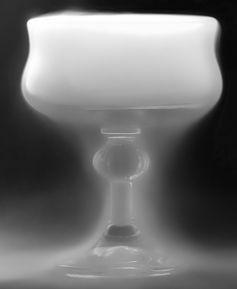 This same effect allows dry ice to levitate freely on top of solid surfaces, as it directly changes from solid to vapour and therefore it too is kept afloat by a layer of newly-formed gas. We can put this to use. By placing water droplets and small blocks of dry ice on top of hot, turbine-like surfaces, we have used the Leidenfrost effect to create rotational motion. The turbines channel the released vapour, whose flow in turn drives the levitating surface above to rotate. 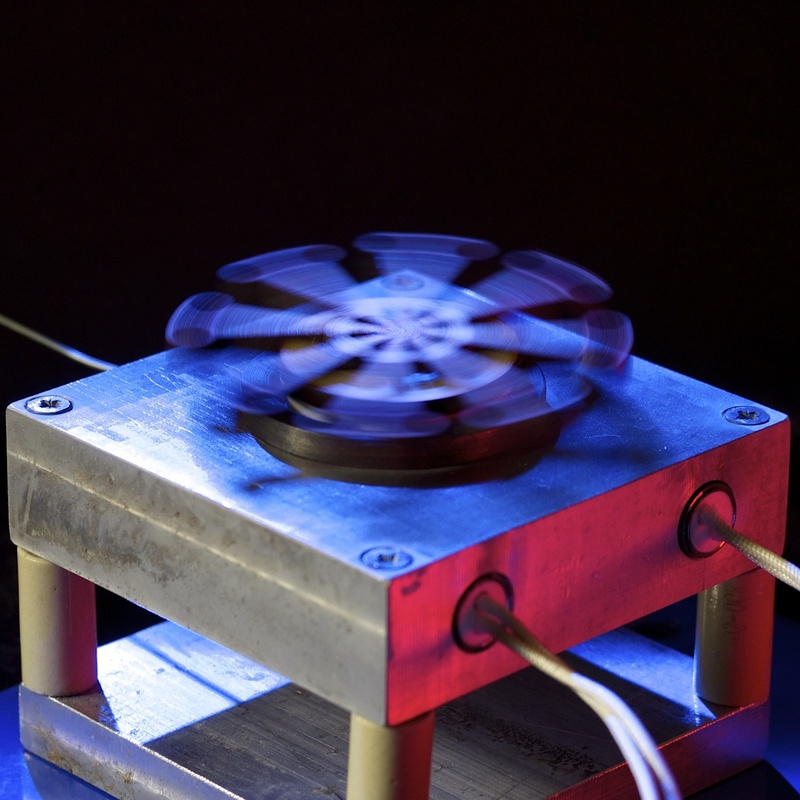 In a series of experiments, we have shown that carbon dioxide is a viable working substance for heat engines. By channelling the vapour released upon sublimation of dry ice discs on top of turbine-like surfaces, we have been able to use dry ice to power an electrical generator. Crucially, the vapour produced by the dry ice discs generates enough pressure to overcome gravity, lifting the disc off the turbine surface through the Leidenfrost effect. The discs thus become levitating rotors, meaning the engine is extremely low-friction. You won’t find solid dry ice occurring naturally here on Earth. However satellite images from NASA’s Mars Reconnaissance Orbiter show the situation is very different on the surface of Mars where large gullies can be found, about 2 km in length. These structures are very different from Earth’s water gullies. Instead of fanning out at their bottom end as you would expect from a gully created by water, Mars’ gullies end in a pit-shaped apron. 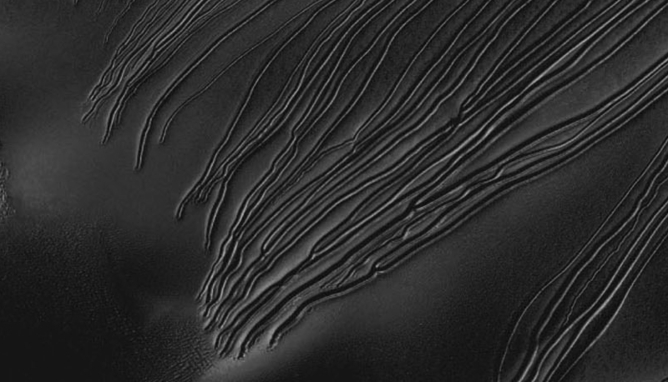 NASA scientists have recently shown that such shapes might be caused by gliding boulders of solid dry ice, which sublimate (turn to gas) as temperatures rise in the Martian summer. Carbon dioxide thus plays a similar role on Mars to water on Earth. It is a widely available resource which undergoes cyclic phase changes under the natural Martian temperature variations. Perhaps future power stations on Mars will exploit all this CO2 to harvest the energy from the sublimation phase change as dry-ice blocks evaporate, or to channel the chemical energy extracted from other carbon-based sources, such as methane gas. Carved out by dry ice floating on cushions of gas? One thing is certain; our future on other planets depends on our ability to adapt our knowledge to the constraints imposed by strange worlds, and to devise creative ways to exploit resources that do not naturally occur here on Earth.